Polar Night up on Beskades. Flat light and high winds yesterday made trails difficult for me to pick out, but the dogs had no trouble. They know where to go. Took the first left on the way up today; I saw someone else's tracks so I hoped it was safe. Eline told me it's a trail used later in the season because it's wet. I didn't know what to expect, and then suddenly, I see my line of dogs disappear in front of me and whoo! I'm flying over the edge... I can see my dogs below me, leaping over open holes in the creek bottom. I barreled down the drop behind the dogs, riding my drag to keep the line tight, and slid safely across the creek. The holes were small. There were several more steep little drops into creek gulches like this in the first kilometer, all with holes along the ice bridges, something the puppies hadn't been exposed to before (or me either for that matter). Good learning experience/confidence booster for all. Not many teams have been this way so the trail was nice and soft with plenty of snow, allowing for some control. Fun! I already feel like an old hand as far as the road's concerned and have started looking forward to the curves. This confidence is empowering and a big change from the white-knuckled rides of a few weeks ago. 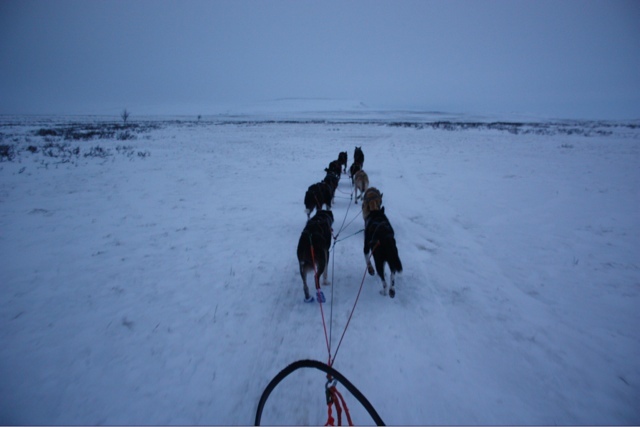 I learned to give up a little control and trust the dogs and my many years on a dogsled to get me down safely. 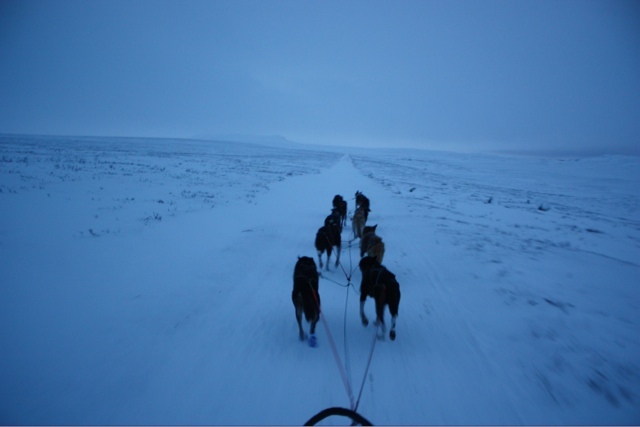 This road with 25kg in the sled and 10 dogs seems weeny compared to some of the corners I've been whipped around on the second sled behind 18 dogs in the Willow swamps. Thinking of that gives me some confidence in myself.... VERY icy today though. One corner is covered in a sheet of glare ice. The dogs always cut the corner though, so the trail curves around in the ditch, which at least still has snow in it. I got another tasty chocolate in my julekalender tonight. To be enjoyed with hot tea and a book on my iPad after chores are done. Thanks, Nisse E!